Product prices and availability are accurate as of 2019-04-19 18:53:37 UTC and are subject to change. Any price and availability information displayed on http://www.amazon.com/ at the time of purchase will apply to the purchase of this product. Author Bookstand is proud to offer Make More Money: 12 Profit Pillars for HVAC Contractor Success by Bookstand Publishing. 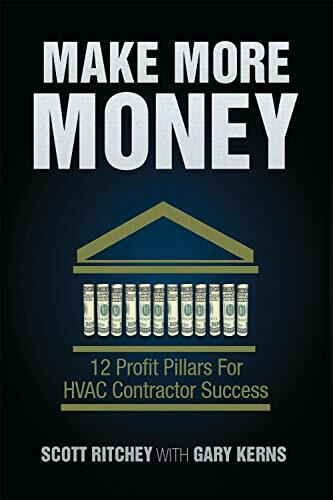 Make More Money: 12 Profit Pillars for HVAC Contractor Success has generated a lot of interest and excitement and we think it would be an excellent addition to your library. This book is dedicated to every HVAC contractor who wants to run a successful business. The business and financial information outlined in this book are guaranteed to work for any size contractor. Author Scott Ritchey is on a mission to help contractors across the country. He focuses his career on providing sound financial training that will help any HVAC owner sustain a successful business. To date, Scott has worked with 395+ companies and thousands of individuals, enabling them to learn important financial principles that all but guarantee success in the HVAC contracting industry. Scott has nearly three decades of experience consulting with HVAC companies all over the United States, and the success rate of the companies he's worked with is simply astounding. Contributing Author Gary Kerns is president and owner of Superior Heating and Air Conditioning, Inc. His background has given Gary a unique outlook on the HVAC contracting industry. After high school, he joined the Air Force. After his stint in the Air Force, Gary became an apprentice with a commercial HVAC company. It was a perfect fit. Gary's talent as a top-notch service mechanic came to the fore and he became enamored with the idea of starting his own HVAC company and did. How Come I Am Always Out of Money?